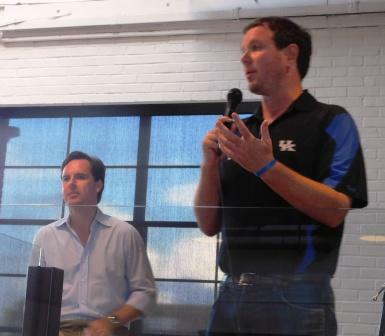 Adam Edelen and Matt Jones talked about the New Kentucky Project in Paducah. 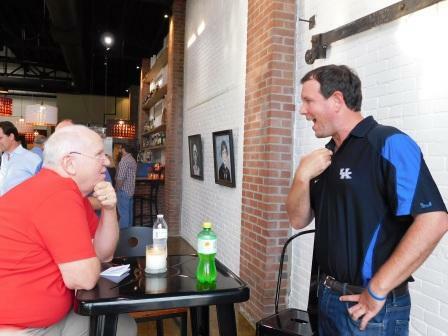 The New Kentucky Project founders Matt Jones of Kentucky Sports Radio (KSR) and former Kentucky Auditor Adam Edelen brought their roadshow on Wednesday evening to the historic 1857 Hotel in downtown Paducah last week. They brought news of a change in the media landscape in 2017. They are launching a news site for Kentuckians unconnected to traditional networks and outlets. Jones said the site will focus on "news you don't see in the two state newspapers." While their plans are short on details, it sounds like it will be an online podcast and website. Edelen said that the launch date has not been set, but he looks for late fall. When asked if the site will be a nonprofit, Jones, shown at right being interviewed by writer and labor activist Berry Craig, said, "No. It will have to make money to be viable." Matt Jones, whose broadcasts focus on University of Kentucky football, basketball and recruiting, manages to slip in some frank political talk along the way. He told the crowd of ninety or so that KSR listeners know his politics, which tilt as blue as the shade beloved by the Big Blue Nation. He's a native of Middlesboro Kentucky with a law degree but his heart is in media. He became more intensely interested in politics when he was asked to run for Congress by Democratic leadership. When offered a trip to Washington, he figured "why not?" and accepted the free trip to DC. Jones, the potential candidate, met elected officials and spent several days learning what it takes to run for office. He noted that the most time was spent on fundraising. What was never asked was his philosophy and opinions on issues. While he chose not to run (yet) an interest in the process bloomed. When asked what he is qualified to do in government, Matt Jones laughed and said that that he isn't the man to run state government. His interest is more in the legislative branch of government, as in the US House or Senate. His interest in challenging Senate Majority Leader Mitch McConnell is the worst kept secret in Kentucky politics. His partner in forming the New Kentucky Project, Adam Edelen, shown at left, has government experience. The former Kentucky State Auditor lost to Republican Mike Harmon in his bid for a second term. Edelen has come to terms with the loss. "It was a wave year." He has moved on to putting together economic development projects. His latest, putting solar panels on strip mine sites in Eastern Kentucky, is close to becoming reality. The plan calls for a cooperative effort between the coal company land owner and the solar panel manufacturer. Edelen says it is unique because of the partnerships involved. Besides bringing jobs, he predicts lower energy prices for Kentuckians. 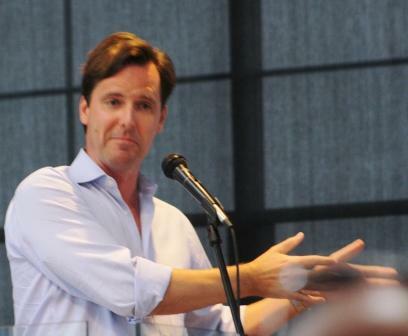 In his address to the crowd, Edelen said that Democrats failed to convince voters they had something to offer. He said Donald Trump made promises he won't keep, but he communicated with frustrated Americans. Edelen said that the plan was for the New Kentucky Project to take several years to scale up. That plan has accelerated. The Project quickly had a mailing list of 10,000 and 2000 dues paying members. The ideas conference held last February in Lexington was envisioned to be a success with 250 participants. Instead over 700 showed up. Edelen admitted there have been bumps and missteps because of the rapid growth. "We're a garage band with one hit." he said. Jones and Edelen will be taking their road shows to other cities. Their last planned stops are Lexington and Louisville. Not because they aren't important, Edelen said, but because there has always been emphasis on the two largest cities in the state. Sarah Stewart Holland, at right, joined the duo on stage to talk about another effort to elect Democrats. This one is exclusively for Democratic women. Emerge Kentucky is part of a nationwide effort to train and support Democratic women running for office. The yearlong program features classes in media, fundraising, and other tools the modern politicians need. Registration opens September 1st. Holland is an Emerge success story. 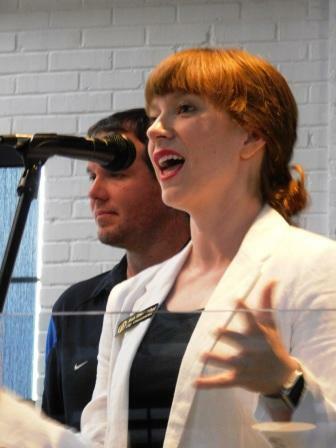 A member of the 2014 Emerge Kentucky class, she ran for Paducah City Council, winning a seat. Holland said she knocked on 5000 doors during her campaign.She said that Emerge Kentucky had a 60% election rate in the wave year of 2016. Holland, Paducah Mayor Brandi Harless and McCracken Family Court Judge Deanna Henschel, all Emerge grads, won their seats in 2016. Edelen and Jones are looking to their age mates and to millenniums to change the face of Kentucky politics. The average age of the crowd at their Paducah event looked to be in their mid-thirties. They have different issues from those presently running the government. Concerns about student loans loom large in this crowd. The sports guy and the oxford cloth rollled up sleeves shirt guy may be onto something.